Thread by @Headsnipe011: "Helping Americans Sidelined by Opioid Addiction and Drug Use Get Back to Work @ScottAdamsSays @drawandstrike @HNIJohnMiller @catesduane @ris […]"
The American economy is strong, and manufacturing jobs are growing steadily. Jobs in goods-producing industries, which include manufacturing, recently grew at the fastest rate since President Reagan was in office. In Utah, 7,400 manufacturing jobs have been added since Nov 2016. Nationally, recent data showed the fewest number of people filing for unemployment in 49 years, and more than 4 million new jobs have been created since President Trump was elected. The Dow Jones Industrial Average and the S&P have recently set record highs. Our economy is creating jobs faster than job creators can fill them. Across the nation, there are 6.9 million open jobs. For the first time on record, there are more available jobs than there are job-seekers. there are 500,000 open manufacturing jobs across the nation, and 2 million have been estimated to be unfilled between 2015 and 2025. Too many Americans are not participating in our nation’s workforce. The national skills gap accounts for much of this shortage. Yet there is another pressing, and deeply troubling, reason for this: the opioid epidemic. Many Americans have left the workforce and remain on the sidelines because of this crisis. Getting Americans sidelined by drug addiction back into the workforce is good for communities and good for business. suggesting a role for the intersecting public health issues of chronic pain and opioid use in the workforce shortage. The Department of Labor’s Women’s Bureau is conducting a similar study of women not in the labor force. committing the full resources of his Administration to helping Americans impacted by opioid addiction. In tackling opioid and other drug misuse head-on, we can both prevent tragedy and put more Americans on a path to recovery, opportunity, and prosperity. Effective treatment is available for opioid use disorder. The gold standard is the use of medication in combination with ongoing behavioral therapy, also known as Medication Assisted Treatment. Comprehensive treatment should also include efforts to enable these individuals to rejoin the workforce. There is strong evidence that a job can help sustain long-term recovery. We recently visited a combined prevention and treatment program administered by Belden, Inc., in Richmond, Indiana. We saw and heard firsthand the powerful effect of businesses, families, and colleagues coming together to fight drug misuse. This recognition is the reason the Department of Labor awarded six pilot project grants to help communities across the country fight the opioid crisis. These pilot projects are helping to provide new skills to workers, including new entrants to the workforce impacted by the opioid crisis. We all must play a role in preventing opioid and other drug misuse, promoting treatment, supporting addiction recovery, and fighting stigma. We encourage individuals to view the Surgeon General’s recently released digital postcard detailing how everyone can do their part, at SurgeonGeneral.gov. Individuals who are battling substance use disorders should have treatment options that comprehensively treat their condition and enable them to re-enter normal life, including work. Treatment works and people recover every day. As we mark National Manufacturing Day, we are grateful for a robust American workforce, and we are committed to addressing drug misuse so that all may access paths to opportunity. Alexander Acosta is the U.S. Secretary of Labor. Jerome Adams is the Surgeon General of the United States. This op-ed appeared in The Salt Lake Tribune on October 6, 2018. Today, I have signed into law S. 3191, the “Civil Rights Cold Case Records Collection Act of 2018” (the “Act”). The Act provides for the review and, where possible, the release of records of criminal investigations relating to alleged Federal civil rights violations between..
1940 and 1980 (“cold case records”). These records, however, include information in the possession of any branch of the Government and could encompass even recently created records that “relate to” alleged civil rights violations from that period. Veterans who are homeless or at imminent risk of becoming homeless can contact their local VA medical center, where VA staff are ready to assist. They can also call 877-4AID-VET (877-424-3838). Vets in crisis or having thoughts of suicide — and those who know a Veteran in crisis — can call the Vets Crisis Line for confidential support 24 hours a day, 7 days a week, 365 days a year. Call 800-273-8255 & press 1, chat online at VeteransCrisisLine.net/Chat or text to 838255.
.@drawandstrike @HNIJohnMiller @catesduane @rising_serpent @_ImperatorRex_ @Debradelai @GodlessNZ @almostjingo @tracybeanz @TheChiIIum H/T @Headsnipe011's list. As @POTUS signs HR 6, the SUPPORT for Patients and Communities Act, to provide tools in the fight against the #OpioidCrisis, we thought we’d share some insights from our 2017 hearing featuring Nobel laureate Sir Angus Deaton, among others. 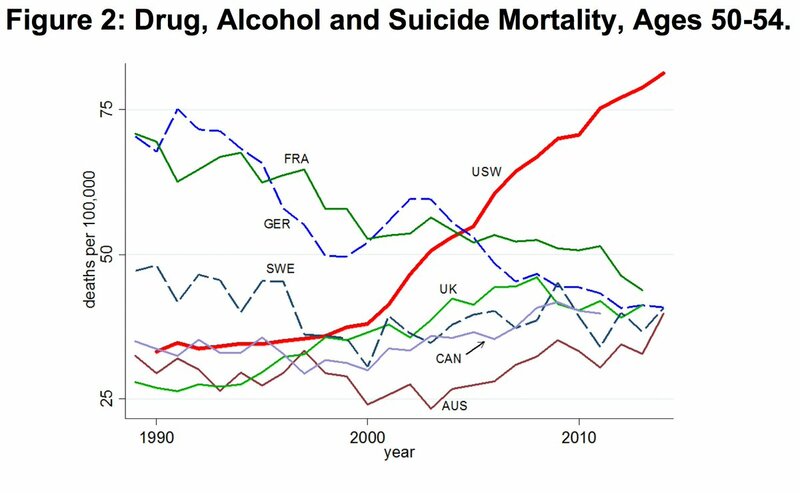 @POTUS Sir Deaton argued that deaths from legal and illegal drugs are contributing to an almost unprecedented increase in overall mortality among middle-aged white non-Hispanics. 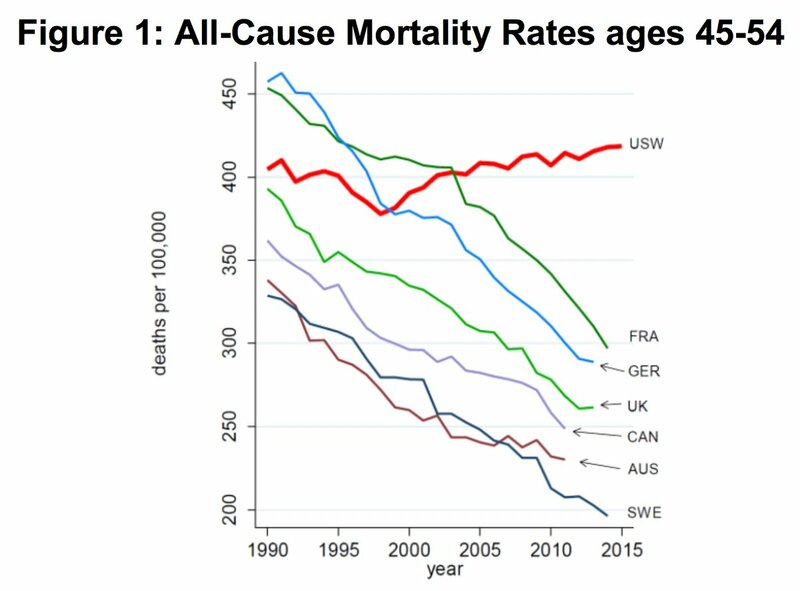 A century of mortality decline came to a halt at the end of the 20th century in America. @POTUS The increase, argued Deaton and Anne Case, is due to a rise in drug, alcohol and suicide related deaths; they stated that the liberal prescription of opioids for pain relief fueled the epidemic. At The Oklahoman’s addiction summit. Kelly Fry is giving the introduction. She had everyone flip an hourglass to remind people how many die of overdoses. Andrew Kolodny from the Opioid Policy Research Collaborative is speaking first. He’s starting with what opioids are. @fortitude253 @MEBier1 @KLVG @steph93065 @murphtoday @Came2BelieveHim @j_garavee @_ImperatorRex_ @tgdesrosier @Wayne34765311 @mgr842day @KandissM1 @ThomasWictor @Headsnipe011 @drawandstrike @HNIJohnMiller @CatesDuane @rising_serpent @Debradelai @TheChiIIum I will read the two articles but next time please put them both in one tweet, or respond with your three tweets as a thread. It's easier for people to follow. PACER records are primary sources, these are secondary, regardless of being MSM or other media. >One of them is based on the other one. >That one is based on the Q spreadsheets that I don't consider reliable evidence & asked you not to offer as such. @fortitude253 @MEBier1 @KLVG @steph93065 @murphtoday @Came2BelieveHim @j_garavee @_ImperatorRex_ @tgdesrosier @Wayne34765311 @mgr842day @KandissM1 @ThomasWictor @Headsnipe011 @drawandstrike @HNIJohnMiller @CatesDuane @rising_serpent @Debradelai @TheChiIIum (2) You said these articles were the best you could do with short notice. I actually don't mind if you take a day or two to come back to me with one good piece of evidence that you believe supports your claim that there are "45,000 unsealed indictments." As you might have heard, @nchousedems are fielding democratic candidates in all 120 House seats in the #ncga. If we want to #TurnNCBlue then we have to support every candidate in our #120DistrictStrategy. Good morning, Iowa. Today @IAGovernor Reynolds will deliver her first condition of the state address as governor. Her speech will begin shortly after 10 a.m. If you're stuck at work but near some internets, stay tuned here for highlights. The ceremonies have begun. #ialegis senators have been brought into the House chamber, where #iagov Reynolds will deliver her address. We'll also get the state Supreme Court justices and state department heads. 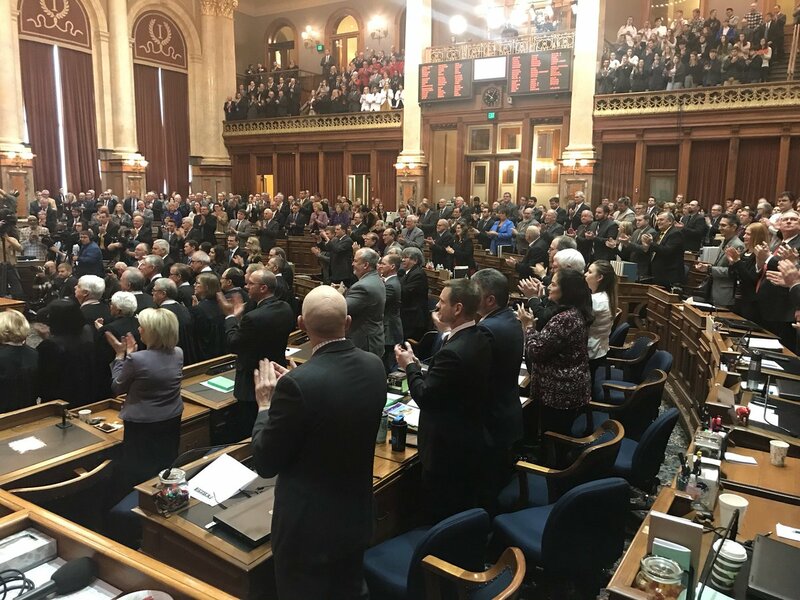 The #ialegis House is never more full than on Condition of the State Day.